Great gift for a new baby or beautiful centerpiece for Baby Shower. The All Terrain Vehicle (ATV) Diaper Cake is built from: # 44 Diapers size 1 (8lb to 14lb) # Cotton Receiving Blanket # Baby Bottle # Pacifier Dishwasher Basket # Bib # Pair of Socks # Washcloth # Toy Bear or Monkey (your choice). This cake Cakes can be made for boy, girl, or we can use your favorite color. Please let us know if you want to change a toy. This cake is approximately 12" Long, 12" Wide by 16" tall. Each cake is served in tulle tied with a premium ribbon... We use Huggies or Pampers Swaddlers in all our products. 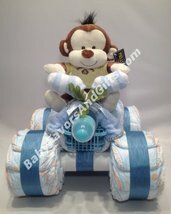 ALL ITEMS IN THIS DIAPER CAKE ARE 100% USABLE This cake is our exclusive and can only be purchased here.